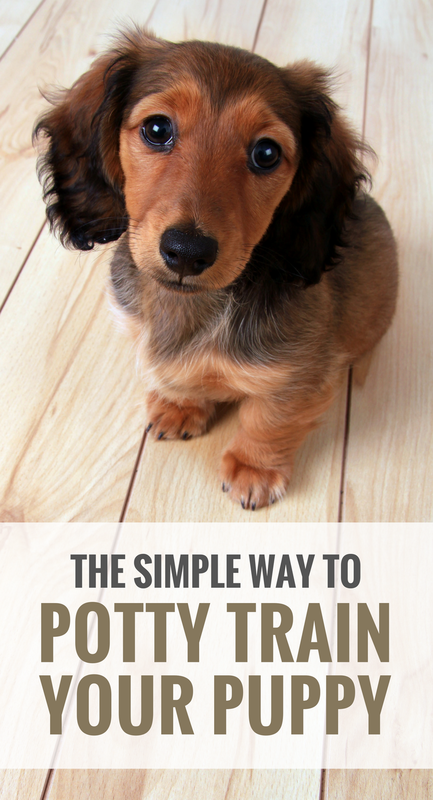 In the late 90’s I found a simple way to potty train a puppy, and it worked so well I’ve been using it ever since. After a week of using these tips you’ll eliminate 90% of accidents, and you’ll be well on the way to a having a fully house trained pup. The process works by being preventing accidents before they happen, and using praise at the right moments to ensure your dog understands where they’re supposed to be going potty in the first place. Since potty training is an ongoing process I’ve split this article up into two week segments. The first week is where the potty training magic happens, and the second week is where the consistency of week one starts to pay off. Here’s 5 simple tips for potty training your puppy. The first week of potty training a puppy is extremely tiring, but I promise it gets easier. You might find yourself questioning why you decided on a puppy to begin with — trust me, we’ve all been there. But after the first week you’ll be able to relax a bit more, and you’ll start to see how well your consistency pays off. The first week is where you’re going to be watching your pup like a hawk, making sure you intervene before any accidents happen. During the first week you’re going to need to be aware where your pup is at all times. 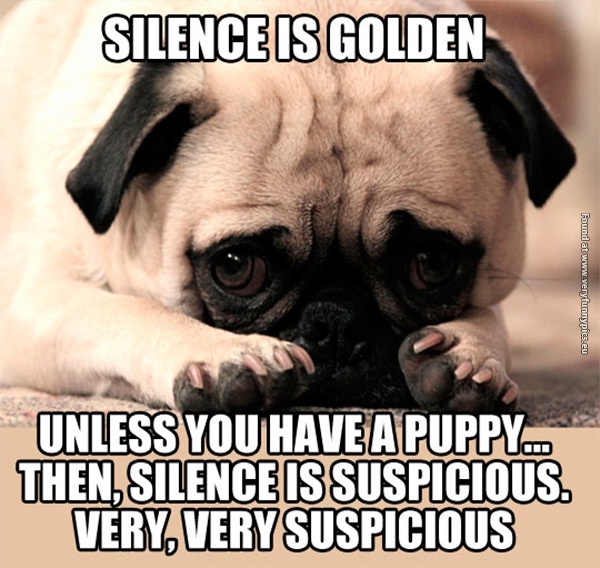 A quiet puppy is trouble, or so the saying goes. Whether he’s getting into the garbage, eating your new shoes or pooping over in the corner — a quiet puppy signals trouble. If you want to prevent accidents before they happen you’re going to need to watch your pup at all times, including every time they wander off. It only takes one accident to set your training back. Now I know that watching your puppy non-stop isn’t exactly fun & exciting, but being able to catch them before they have an accident is why this method works so well. If you’re like me and have trouble keeping up with your pup at all times try using a tether. You can buy a tether from the pet store or simply do what I did and use a long lead or leash. If tethering your pup to you at all times is what it takes to make sure they’re not sneaking off then go for it. If you’re not keen on keeping your dog tethered you can use baby gates or closed doors to restrict your dogs access to the whole house. Did I mention the importance of not letting your dog out of sight? I did, but this part is so important I need to mention it twice. Your job when house training is to be there to prevent accidents before they happen. You know when your dog is going to have an accident? The moment you’re not looking. There’s not much you can do that makes sense after your dog has had an accident — and you’ve missed out on an important training lesson. Don’t punish your dog if they pee inside. Regardless of all those old training ideas punishment isn’t a good deterrent for house training. Yelling at your dog after the fact just confuses them and makes them nervous around you. If you catch your did in the act you can try to get their attention & move them outdoors. If you’re successful & they continue going once you get outside praise them like crazy. Your pup is going to have an accident or two in the house – there’s no getting around it. What you can do is prevent them from having more by being proactive. Keep them in your sight at all times and take them out every time they start to wander off. Letting your pup outside every hour or two gets old, but it’s the simplest way to prevent accidents from happening. If you’ve ever wondered why some people choose to get new puppies during the summer or when they’re on vacation it probably has to do with potty training. If you’ve house training a dog before you know how much time & commitment it takes. Sometimes your dog might not pee outside and that’s OK. An unproductive outside time is better than an accident indoors. Let them wander around a little bit & head back inside. Though most dogs can handle sleeping through the night without accidents keep in mind that their bladders are awfully small so if you can avoid sleeping in I’d do so. Most puppies just can’t hold it for that long. To prevent overnight accidents make sure your pup has peed before bedtime. Every time your dog pees or poops outside it needs to be celebrated. Give them baby talk or a treat, jump up & down, pat their little heads & remind them of how brilliant that decision was. Yes it might look silly but your pup needs to know he’s done the best thing ever. When you consistently praise your puppy for going outside they’ll start to understand that going potty outside is the best decision available. This is the ‘keep it up’ period where the praise is still heavy but you can relax a little more when it comes to watching your pup. Don’t get lazy with the praise during the second week. You want your dog to be the proudest creature on earth every time he pees or poops outside. 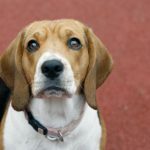 Yes it seems silly after a while, and maybe even a little creepy if your dog stares at you while doing their business – but rest assured, you’re getting the message across. Let your dog know that peeing & pooping outside is awesome, and that all sorts of great things come to pups that do awesome things. Though it differs by each individual dog this is the time when most will come up with their own little way of letting you know they’ve got to go. It might be crying at your feet, ringing a bell you’ve set up or waiting at the door — just be sure to pay attention to these signals & follow up. Once your dog knows how to get your attention when he’s got to go you can relax a little and congratulate yourself on a job well done. 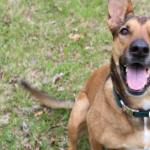 If your dog isn’t giving you an obvious signal that they need to go out (like whining at the door) I suggest teaching them to ring a bell when they need to go outside. Some of the other signs dogs give that they need to go out such as pacing around or circling can be easy to miss if they’re in another room, which is why a noise based signal such as ringing a bell can make things easier. Accidents will happen, and it’s important to clean them up thoroughly. Dogs are attracted to spots that they’ve used previously, and remember that their sense of smell is way better than ours. Pet urine can be hard to get out, and not all household products will effectively remove odors. If your dog keeps going in the same spot chances are some of that smell has been left behind. 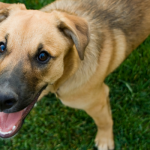 You can opt for a product that’s formulated for removing pet urine odors & stains. Young puppies can’t hold their bowels & bladders for long. If you come home to find that they’ve had an accident in there it’s quite possible that they can’t hold it that long. 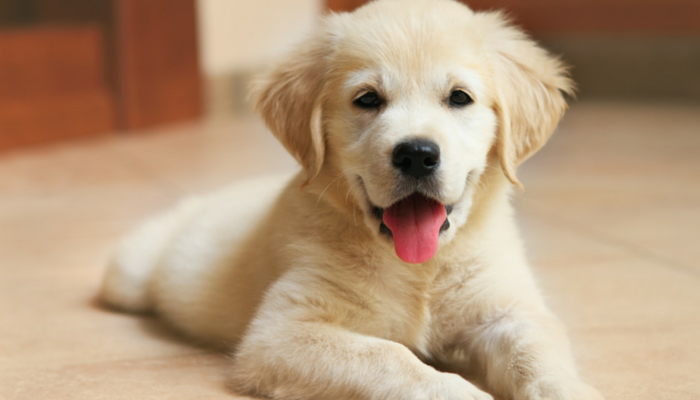 Generally puppies can hold their bladder for about one hour per month of age. So your 3 month old pup can probably only hold their bladder for about 3 hours. If you’re going to be away at work for long periods of time see if you can get a neighbor, relative or dog sitter to come over to let your pup out during the day. How Did You House Train Your Dogs? 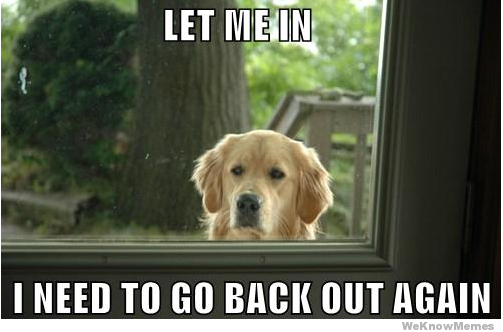 Did any of your dogs give you any trouble when it came to potty training? Did you use a crate or puppy pads? What methods worked well for your dog? We had the pleasure to potty training littermates – twice. One tip that I have for everyone is when you take your puppy out make sure they take a potty. There are so many distractions that they may forget the goal, come back inside, and immediately potty on the area rug. The praise parade is so very important so I’m glad you mentioned it. That works like a charm. And don’t become too dependent on potty pads. What we did was put the pads near the door and when the puppies walked to the pads, we opened the door and went outside. Find justin boldoni on facebook her dog training tips can make your dog do many things just in few days. Although I’ve never had a puppy of my own, with adult rescue dogs I always assume they aren’t potty trained and use the tips you list here, starting from scratch. Of course, with bigger bladders and possible past experience they generally catch on really quickly. Thanks for the great tips. We are getting a puppy next month and it will be 8 weeks old. Do you suggest keeping the puppy in it’s crate (its a mini labradoodle) the first week when it’s not outside? What do you do if your puppy gives no signs that they need to pee? My little girl is 9 weeks old. When she’s in the crate she cries to let me know she needs to go potty, but when I have her tied to me I can’t tell she has to pee. She doesn’t cry or sniff around. She simply squats and pees. So we end up having accidents. I have a 3 year old cockapoo who will let me know when she has to poop but still need off the paper when she pees. Had my niece come during the summer with her 5 month old pit huskey mix who was sweet and house trained but overwhelming to my dog. Since then she tends to pee everywhere. I do keep papers down still but she will pee on paper but walk off still peeing. How do I get this to stop. She’s 3.